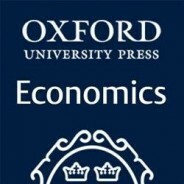 You can discover news, resources, and insights from the Economics team at Oxford University Press by following @OUPEconomics on Twitter. We are by now more or less aware that income inequality in the United States and in most of the rich OECD world is higher today than it was some 30 to 40 years ago. Despite varying interpretations of what led to this increase, the fact remains that inequality is exhibiting a persistent increase, which is robust to both expansionary and contractionary economic times. One might even say that it became a stylized fact of the developed world (amid some worthy exceptions). The question on everyone’s lips is how can a democracy result in rising inequality? In one of the seminal papers in political economy, Meltzer and Richard (1981) proposed a theoretical model in which more democracy implies more redistribution and hence lower inequality. The idea is that the median voter is usually to the left of the mean income voter in a typical income distribution curve, which is always slightly tilted to the right – meaning there are more poor people than rich people in a society. The larger the gap between the mean income voter and the median population voter (i.e. the poorer the median voter) the more redistribution will be demanded (under the classical Downsian assumptions of electoral competition). This also implies that more unequal countries should have larger governments. We of course know this is not true, primarily since most unequal societies are not democracies, meaning that their ruling elites don’t really care of the position of the median voter. But it is true that more democratic societies do on average have lower inequality. Note: The Freedom house democracy ranking is from 1 (the most democratic) to 7 (the least democratic). 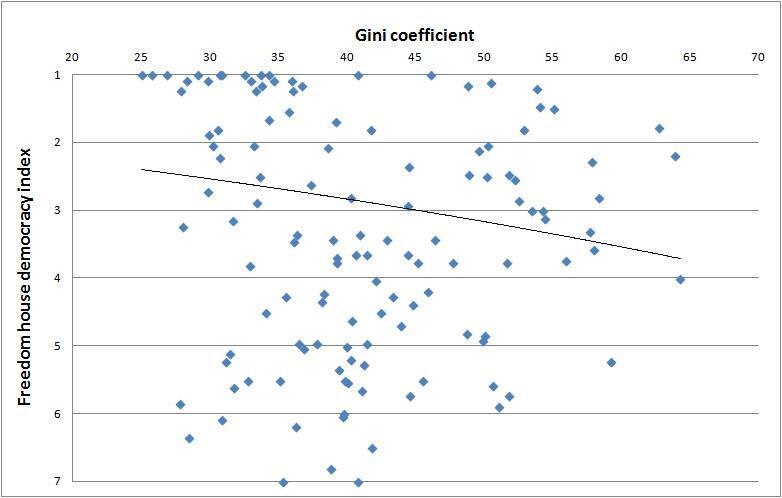 Higher Gini implies higher inequality. This graph deploys averages of the democracy index and the Gini in the past 20 years. Source of data: Gini: World Bank. Democracy: Freedom House. Graph used with permission of Vuk Vukovic. Note however that this is mere correlation, not even a strong one, and it doesn’t tell us a lot about why inequality in the West is still rising. It does not explain the dynamics of inequality. And while it’s relatively easy to explain the persistence of inequality in institutionally weak societies, the question remains as to why the median voter in the West is still disenfranchised? Shouldn’t the persistence and consolidation of a democracy imply a gradual decline of inequality over the past generation? The rapid rise of interest group power can help us provide a partial answer. As interest groups in democracies become better organised, they become more successful at increasing the size of government but bias that increase towards themselves. This leaves relatively less money for redistribution and programs aimed at the poorer ends of the society, particularly in terms of education and health care. The theory of collective action explains this phenomenon where small (privileged) groups possess enough information, have low enough organization costs, and are far more homogeneous in distributing the potential benefits to successfully solve the public good allocation problem. As the number of interest groups fighting for state redistribution increases, this becomes a wider burden for society, whose productive resources are being sub optimally allocated. We can call this phenomenon “interest group state capture” which unfortunately characterizes more and more democratic societies today – both rich and poor. If we label the emergence of interest groups as the “macro” cause for rising inequality, then the structural factors such as technology and education, arguably even more important, can be called the “micro” causes. It is indicative that the inequality gap started increasing since the 80s, just around the same time the third industrial revolution started changing the patterns of job market specialization. The culprit for higher inequality, in my opinion, can be found in the interaction of several factors (in addition to the aforementioned interest group capture). Rapid technological progress in the past 30 years resulted in a typical creative destruction process where new jobs and careers made certain types of old jobs obsolete (automated work). Some of these obsolete jobs were outsourced to Asia, while low-skilled workers back home found themselves to be the technological surplus. In addition, a lot of low-skilled labour entered the market (mostly via higher immigration) who failed to adapt to the changes and were left stranded either at lower paid jobs or became long-term unemployed. Poor education played an important role as well, while stagnating wages in the “dying” sectors only widened the gap. On the other hand, the innovative part of the equation was working quite well, taking advantage of the new technological wave, thus raising the income of the top 10% (hence the great disparity in income between workers who hold a college degree and those who do not). It’s not hard to imagine how these two pulling forces (one downwards, one upwards) managed to widen the inequality gap in many of the OECD countries. However none of these issues affected the real US problem: stagnating social mobility. The underlying causes behind this structural phenomenon can indeed be blamed on interest group capture of democracies. The solution to this problem is thus, primarily political. Featured image credit: Spirit Level, by aTarom. Public Domain via Wikimedia Commons. Vuk Vukovic, MSc holds a Master of Science in Political Economy from the London School of Economics and Political Science. He works as a lecturer at the Department of Economics, Zagreb School of Economics and Management, and is a research fellow for the Adam Smith Institute in London. He blogs regularly and you can also visit his webpage.